The German mathematician Karl Friedrich Gauss made outstanding contributions to both pure (studied for its own sake) and applied (studied in order to solve specific problems) mathematics. extremely bright child, correcting his father's arithmetic when he was three years old. His intellectual abilities attracted the attention of the Duke of Brunswick, who sent him first to the Collegium Carolinum (1792–95) in Brunswick and then to the University of Göttingen (1795–98). In 1801 Gauss published Disquisitiones arithmeticae, which is often regarded as the work that marked the beginning of the modern theory of numbers. It combined the work of past scientists with his own, and was presented in such an elegant and complete way that it rendered previous works on the subject obsolete (out of date and no longer needed). Gauss made many outstanding contributions to the theory of numbers, including research on the division of a circle into equal parts. This solved a famous problem in Greek geometry (the study of points, lines, angles, and surfaces), namely, the inscription (drawing inside) of regular polygons (closed figures bounded by straight lines) in a circle. First, Gauss proved that a regular polygon with seventeen sides can be constructed with a ruler and compass; he then showed that any polygon with a prime number (able to be divided only by itself or the number 1) of sides can be constructed with these instruments. Gauss also gave three proofs for the idea—conceived by others but never proved—that every equation in algebra has at least one root. Gauss was the first to adopt a strict approach to the treatment of infinite (never-ending) series of numbers. He also opened up a new line of research by updating the definition of a prime number. The discovery by Giuseppe Piazzi of the asteroid Ceres in 1801 increased Gauss's interest in astronomy, and upon the death of the Duke of Brunswick, Gauss was appointed director of the observatory (a building whose purpose is to observe stars and planets) in Göttingen, Germany, where he remained for the rest of his life. Gauss successfully determined the orbit of Ceres and was able to predict its correct position. Gauss's success in these calculations encouraged him to develop his methods further, and in 1809 his Theoria motus corporum coelestium appeared. In it Gauss discussed how to determine orbits from observed data. In his calculation of the orbits of planets, Gauss used the method of least squares. This method is used to determine the most likely value of something from a number of available observations. In defense of the method, Gauss created the Gaussian law of error, which became known in studies of probability (chance) and statistics (the collection, study, and presentation of data) as the normal distribution. Although he published nothing on the subject, Gauss was almost certainly the first to develop the idea of non-Euclidean geometry (disputing one of Euclid's [335 –270 B.C.E. ] theories that through a given point not on a given line, there exists only one line parallel to the given line). As adviser to the government of Hanover, Gauss had to consider the problem of surveying (measuring and determining exact position of) hilly country. This led him to develop the idea that the measurements of a curved surface could be developed in terms of Gaussian coordinates (points). Instead of considering the surface as part of a three-dimensional (displaying depth) space, Gauss set up a network of coordinates on the surface itself, showing that the geometry of the surface can be described completely in terms of measurements in this network. Defining a straight line as the shortest distance between two points, measured along the surface, the geometry of a curved surface can be regarded as a two-dimensional (lacking depth) non-Euclidean geometry. 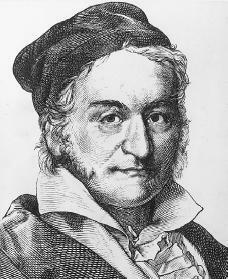 Apart from his books Gauss published a number of memoirs (reports of his experiences), mainly in the journal of the Royal Society of Göttingen. In general, however, he was unwilling to publish anything that could be regarded as controversial (causing a dispute), and as a result some of his most brilliant work was found only after his death. Gauss married twice, but both wives died young. Of his six children, his youngest daughter remained to take care of him until his death on February 23, 1855. Buhler, W. K. Gauss: A Biographical Study. New York: Springer-Verlag, 1981. Dunnington, G. Waldo. Carl Friedrich Gauss, Titan of Science: A Study of His Life and Work. New York: Exposition Press, 1955. Schaaf, William L. Carl Friedrich Gauss: Prince of Mathematicians. New York: Watts, 1964.